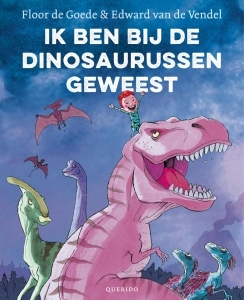 At the annual children's books award ceremony our book IK BEN BIJ DE DINOSAURUSSEN GEWEEST (I WAS WITH THE DINOSAURS) got an Honorary Mention for the text (in Dutch: Vlag en Wimpel). This is a very nice reward (thank you, jury!) for the effort that was put into this book. The book was written for illustrator Floor de Goede, who used to be a 'dinosaur-kid'. He outdid himself, and I'm glad the book will get some more attention now. The picture book, which was published by Querido, Amsterdam, was already chosen amongst the ten books for the picture book days. It describes how a young boy wants to emerge himself in the dinosaur's world, by reading about it in his favorite book. But then his parents call him... The book, with ample text, is an ode to the colourful imagination children spin (and to the dinosaurs of course!). The book has also been published in Denmark, by Turbine Forlag, and rights for other languages can be discussed here.